Cyclesnack: Another Monster in Newtown! After Saturday's ride I was driving up to the center of town on a few errands when I saw this guy riding up Hanover Road and at first, I thought just another roadie. As I got closer, a few thing stood out, 700c's with fat tires, not 29ers tires, but almost as fat. Flared drops and levers on the angled bar, canti's, and a Rohloff to boot! Another Monster Crosser! I slowed down and said hello and noticed that he was riding a Surly frame. He had the Cane Creek Drop V brake levers. 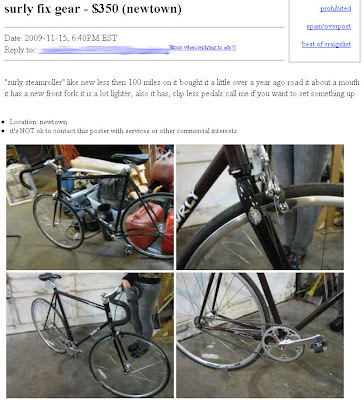 At first I wondered if it was the one that I saw on Craigslist the other day but it wasn't looking at the add above it clearly is not. It was dark blue and I thought Surly printed on the top tube but I could have been mistaken.